It is time to stop calling anyone who does not follow sound doctrine, true Biblical theology, founded upon solid Bible teaching and Bible belief a Christian. Just because a person or a group takes the mantle of calling themselves such does not mean that they are genuine, true disciples of Jesus Christ. To be a real Christian means a person places their trust and faith in the One True God, Jesus Christ the Lord, the Holy Spirit and turns to, knows, reads, studies, prays upon and knows in their heart the Scriptures are the inspired word of God. They also know anything that does not synchronize with what is contained in God’s word is thus a false teaching, unsound doctrine — a LIE — and has no part of being a genuine Christian. At this juncture in history there are more so-called “Christians” actually serving and following the Evil One, the devil than are following God, Jesus, the Holy Spirit and the inerrant word of God. It is safe to say that around 7 out of 10 professing to be “Christian” in these times is anything but and it is also time we who have the eyes of understanding within our hearts, knowing provided to us by the indwelling of the Holy Spirit teaching us the truth from God’s word stand firmly, boldly and clearly speaking and writing the truth about these matters. The made up word “Chrislam” is just further evidence of the massive erosion and taking over within the church of the world’s lie and evil. With all lies originating with the father of lies, the devil, the Evil One. We are to test EVERYTHING. Search out EVERYTHING. As those in Berea did whenever they had someone come to them proclaiming to be of God. They searched the Scriptures. Even when the apostle Paul came to preach and teach. To verify Paul was of sound Biblical doctrine. Sound theology. We must do the same. In EVERYTHING. There is only ONE TRUE GOD — the God of Abraham, Isaac and Jacob — the God who created everything there is that is created with His only begotten Son, Jesus Christ the Lord. The God of the Jews and of true Christians. All other gods are false gods. Deceptive gods. Creations of man. Leading those who allow them in, or follow them to their eternal deaths. When God, who came to earth to take on the form of man in Jesus Christ, who lived about 2,000 years ago to fulfill Scripture prophecy (the entire Holy Bible is the story, the history, the telling of either the coming Messiah, His first coming on earth, or His eventual return — the Bible from cover to cover is all about Jesus. Totally about Jesus the son of God) returns to judge everyone who is alive when He returns along with everyone who has ever lived on this earth those who place “inclusiveness” and “tolerance” and worldly beliefs over sound doctrine, sound theology and the complete truth of God’s living word are going to be in for quite a surprise. And they will have their eternity to ponder, wail, gnash their teeth, scream and cry out in eternal agony for their following unsound doctrines, following the father of lies rather than God the Father and His Son, Jesus Christ the Lord. Do not be soft or ignorant of what it taking place all around us constantly. Do not ignore the ongoing spiritual warfare, the increasing deceptions, lies, falling away, increase of false teachers, false teachings, unsound doctrine and totally false theology. Turn to the Holy Bible. It’s the only book anyone really needs. It’s the only book on earth totally true. It’s the only book that can open the heart to eternal life through true faith and belief in Jesus the Lord, God the Father and the Holy Spirit. Where Islam, allah, Mohammed / Muhammad, Buddha, and the hundreds, the thousands of other perverse, corrupt, lying false gods are nowhere to be seen except in learning replacing the One True God, replacing His Son, Jesus Christ the Lord with any of them leads to eternal death. While faith and belief, pure faith, purity of heart, purity of belief, knowing the Holy Bible is the God-breathed inspired living word of God and there is no other source for eternal life. The days grow more dark and evil. Now is time to increase in Biblical spiritual wisdom and discernment. To increase in genuine faith in Jesus, the One True God, the Holy Spirit and God’s inerrant word. Let’s stop calling those walking in darkness, following lies, spreading false teachings, refusing the truth, adhering to unsound doctrines and void of sound theology the term and designation of “Christian,” please and let’s begin to speak and write the truth without fear. Let’s call a lie a lie, A false teaching a false teaching. A false faith a false faith. Our eternities depend upon being true to God and the Bible not true to the corruption of this world and its billions of people walking in darkness following the devil rather than God, Christ, the Holy Spirit and the Holy Bible. Let us pray fervently the false teachers repent and are silenced not spreading unsound doctrine and faulty theology. Let us pray daily, continually, fervently the Light pushes out the darkness and those who are walking in darkness lulled, lured, seduced by the lies of the Evil One and his ministers have their hearts made clear and open and turn from their error and turn to the One True God our Father, Jesus Christ the Lord and Saviour and only way to the Father and eternal life in heaven, place their faith and trust in the Holy Spirit to instruct and guide them in the truth of God’s word the Holy Scriptures and they do this will God of mercy, love, forgiveness and salvation blesses them with breath and a beating heart. The mantra that “we all worship the same god” has been taken a step further by First United Methodist Church at the Chicago Temple by hosting a new play called “Christmas Mubarak,” mixing Christian and Muslim stories of Jesus’ birth. Rather than Jesus being born as the incarnate Son of God, the baby actually speaks and announces he’s a prophet. Similarly, Joseph is not depicted as Mary’s fiancé, but rather as a cousin and the play describes prophecies about Jesus’ return, though Muslims do not believe, as Christians do, that Jesus was crucified, died and rose from the dead. Though the play’s directors say “Christmas Mubarak” is “a wonderful way for both Muslim and Christian to refresh their understanding of the story,” this is nothing short of blasphemy. It perverts the story of Jesus’ birth; it doesn’t refresh it. No prophet could save people from their sins. Only the incarnate Son of God could do that. That any Christian church would participate in this play is disgraceful. However this is not the first time a church has embraced what is often referred to as “Chrislam”, the term used to suggest that Christianity and Islam share similar beliefs and as such are compatible. Those Christian churches that have so blurred the differences and distinctions between Christianity and Islam are on the rise and the next generation of youth seems to be ready to endorse such beliefs despite Christianity and Islam being diametrically opposed on the most important of issues – the identity of Jesus Christ. True Christianity declares Jesus to be God incarnate. For Christians, the deity of Christ is a non-negotiable, for without His deity, Jesus death on the cross would not have been sufficient to be the atoning sacrifice for the sins of the entire world (1 John 2:2). Islam adamantly rejects the deity of Christ. The Quran declares the idea that Jesus is God to be blasphemy (5:17). Belief in the deity of Christ is considered shirk (filth) to Muslims. Further, Islam denies the death of Christ on the cross (4:157-158). The most crucial doctrine of the Christian faith is rejected in Islam. 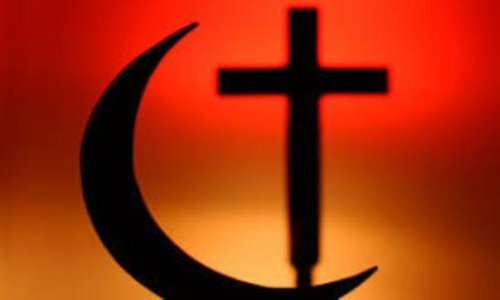 As a result, the two religions are absolutely not compatible, making Chrislam a concept both Christians and Muslims should reject. Several years ago during the same Christmas season this deceptive belief raised it’s ugly head when Wheaton College professor Larycia Hawkins became the center of controversy by announcing that she would be wearing a hijab during Advent to show religious solidarity with Muslims. We increasingly hear and read that Christianity and Islam “share” Jesus, that he belongs to both religions. This shift of thinking reflects the growing influence of Islam in our culture and even in the church. The latest mantra is that we are all “people of the book”. Rev. Ann Holmes Redding, an Episcopal priest for over twenty years, dons her white collar of Episcopal priesthood on Sunday mornings, then ties on her black headscarf to pray with her Muslim group on Fridays, saying, “I am both Muslim and Christian”. She sees compatibility in Islam and Christianity at the most basic level and has endorsed the Muslim teaching that all true Christians will accept Islam. Brian McLaren, founding pastor of non-denominational Cedar Ridge Community Church in Baltimore, Washington, and a leading voice in the emergent church movement encouraged his congregation and other Christians through his blog to participate with Muslims in a Ramadan fast, which celebrates the month the Qur’an was supposedly sent down. Another leader in the Emerging Church movement, Dr. Tony Campolo, says he is not convinced that Jesus lives only in Christians, reasoning that an Islamic brother who has fed the hungry and clothed the naked clearly has a personal relationship with Christ, only he doesn’t know it. A few years ago, Memorial Drive Presbyterian Church in Houston joined with Christian communities in Atlanta, Seattle, and Detroit to create a series of sermons designed to promote an ecumenical reconciliation between Christianity and Islam. Sunday School lessons on the same theme would center on the inspired teachings of the Prophet Mohammad, and Qur’ans and Bibles would be placed side by side in the church pews. Ironically, a side by side comparison of the Bible and the Qur’an would show two faiths that are the exact opposite. The Jesus of the Gospels is the basis upon which Christianity developed. By Islamizing Him, and making of Him a Muslim prophet Who preached the Qur’an, Islam destroys Christianity and takes over all its history. It does the same to Judaism. In the end times as described by Muhammad, Isa becomes a warrior who will return with his sword and lance. He will destroy the Christian religion and make Islam the only religion in all the world. Finally at the last judgment he will condemn Christians for believing in the crucifixion and the incarnation. This final act of the Muslim Isa reflects Islam’s apologetic strategy in relation to Christianity, which is to deny the Yeshua of history, so that nothing remains but Islam. Rather than trying to pretend we believe the same things and create a system of belief that both fundamental Islam and Biblical Christianity reject, a frank and honest discussion about our differences would seem to make much more sense. Part of the problem with our culture is that we use similar terminology but mean different things by those same words. Until we examine what is actually meant by what we say, confusion will abound. This confusion is best summed up by Malik Gillani, the founder of the Christmas Mubarak play who in response to such criticism says, “I believe in the miraculous birth of Christ. We Muslims believe Jesus ascended to God; but that he was not crucified. But what is wrong with us not thinking he died for our sins?”.